Posted on 5/24/2012, 12:56 pm, by sweets4ever, under Craftster Project Ideas and Tutorials. 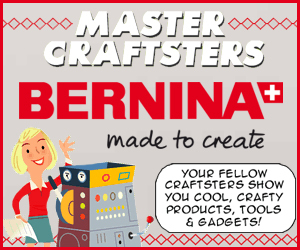 In this installment of Master Craftsters, five talented Craftster members – Abbeeroad, kittykill, Leslieshappyheart, MissingWillow and rlynn – received sewing machines from BERNINA’s 3 Series line of sewing machines. Here‘s a quick look at what they received and what they crafted!